I confess, I am a total gadget fiend. From food processors to smart phones, I find it simply impossible to resist the lure of those shiny machines that promise to make my life easier, happier, more interesting. My love affairs with such icons of contemporary life may be short lived, but they are passionate while they last. A new panini maker in my house? My family eats panini for breakfast, lunch, and dinner for a month. Waffle maker? How many flavors of waffles can I experiment with in a week? When I discover a new gadget, I can hardly think about anything else until I get one in my hot little hands. So it was that several years ago, I succumbed to the siren’s song of a stovetop smoker after reading an article about such contraptions in a popular food magazine. A lover of smoked foods, I ordered up one of these babies ASAP. In the weeks that followed, I enthusiastically experimented with all kinds of foods—chicken, duck, salmon, trout, and even tofu—until Doug put the kibosh on my smoking binge. “It’s just too much smoked stuff,” he insisted, explaining that he was not as much of a fan as I. Promising to take a break, I tucked the smoker away in the back of the kitchen cabinet and promptly forgot all about it. And then I think I lost the manual when we moved. Sad to say, at this point, I have no idea how the thing even works. Sigh. But on a recent trip to my neighborhood Asian food mall, I wandered into the Ten Ren Tea Company. Browsing the shelves, I picked up a canister of lapsang souchong, a black tea that has been smoke-dried over pine fire. The strong smoky scent immediately brought to mind the famous, and famously elaborate, Szechuan dish Tea-Smoked Duck. I thought there must be a way to use this earthy tea to approximate the smoked effect I love in food without all the hassle, or the use of any fancy contraptions. I bought a couple of ounces post haste and scurried home to do a little research. 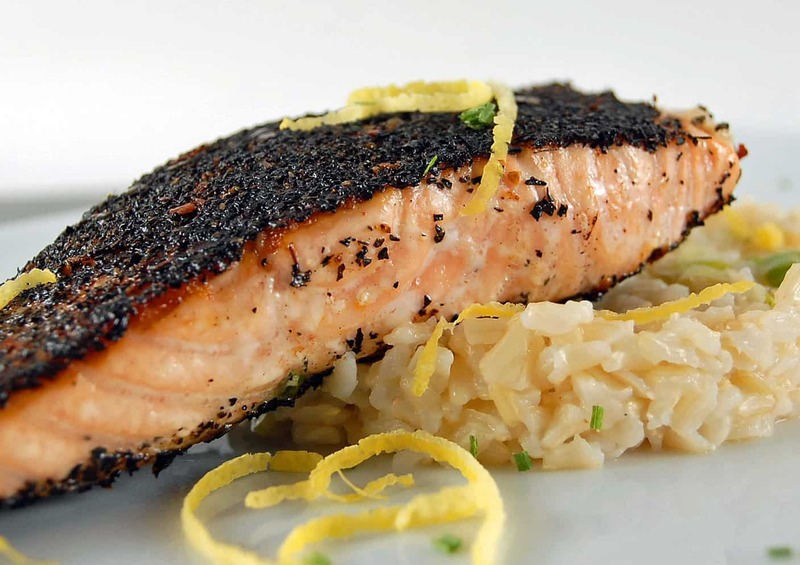 A Google search led me directly to a recipe by one of my favorite East-West fusion chefs, Ming Tsai, for Tea-Chile-Rubbed Salmon with Lemon-Scallion Rice. Too lazy to return to the store to pick up the numerous spices in Tsai’s version , I simply pared his recipe down so that I could use what I had on hand. I also opted for a lower ratio of tea to other spices and left out the chipotle powder as I wanted the subtle effect of smoke without overwhelming Doug’s taste buds with smokiness. 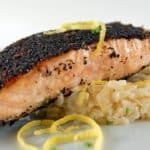 This easy entree recipe came together in minutes, the smoky tea and blend of spices lent an undeniably intriguing flavor to the fish, and the lemon rice provided a lovely fresh and clean complement to the earthy flavor of the salmon. Now the question is, do I cast aside my old stovetop smoker like a lover I’ve grown bored of to clear out room for my next gadgetary object of infatuation? Or should I do an online search for the manual and give that shiny machine one more chance to rock my world? This easy entree takes very little time to prepare. The smoky tea and blend of spices lend an undeniably intriguing flavor to the fish, and the lemon rice provided a lovely fresh and clean complement to the earthy flavor of the salmon. Adapted from Simply Ming, by Ming Tsai. Place the rice, water, lemon juice and zest (reserving some for garnish), scallions (reserving some for garnish), and salt in a rice cooker and cook according to the rice cooker’s instructions. Alternatively, you can make the rice on the stovetop by placing the rice in a medium saucepan with a tight-fitting lid. Add the water, lemon juice and zest, and salt and cover and bring to a boil over high heat. Reduce heat to medium and simmer for 30 minutes. Turn off the heat and let the rice stand, covered, 20 minutes more. In a wide bowl, stir together the tea, salt, garlic powder, five-spice powder, and cayenne pepper. Heat oil in a large, heavy skillet over medium-high heat. Coat the salmon fillets thoroughly on both sides with the tea-spice mixture. Cook in the hot skillet, 3 to 4 minutes per side, until browned on the outside and just cooked through. Serve salmon over rice, garnished with lemon zest and scallions.